Pipe Guides Designed for a Recovery Boiler | Piping Technology & Products, Inc. These pipe guides were designed for a recovery boiler in a power plant in Oklahoma. The guides were designed to control lateral pipe movement and maintain the alignment of the piping through its axial and contraction cycles. They were designed to support 6″, 12″ and 18″ pipes and range in length from 70″ – 120″. 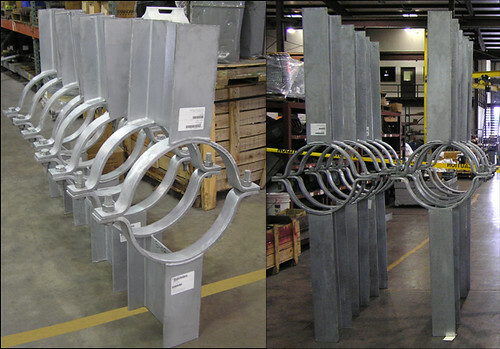 The assemblies were fabricated from carbon steel with a hot-dipped galvanized finish.